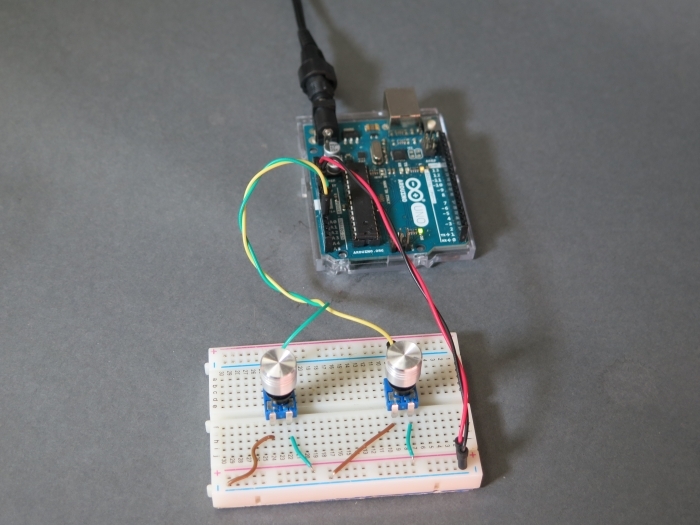 This example describes how to exchange data between two Arduino boards. 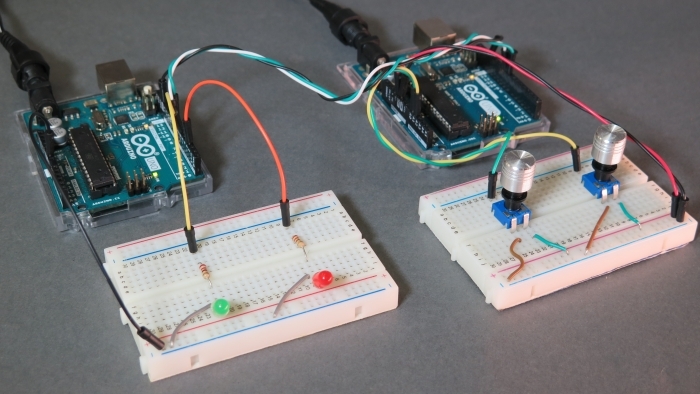 For the data source, we will use two potentiometers connected to the first Arduino board. We will serialize the data into formatted text lines and send them via UART to the second Arduino board. 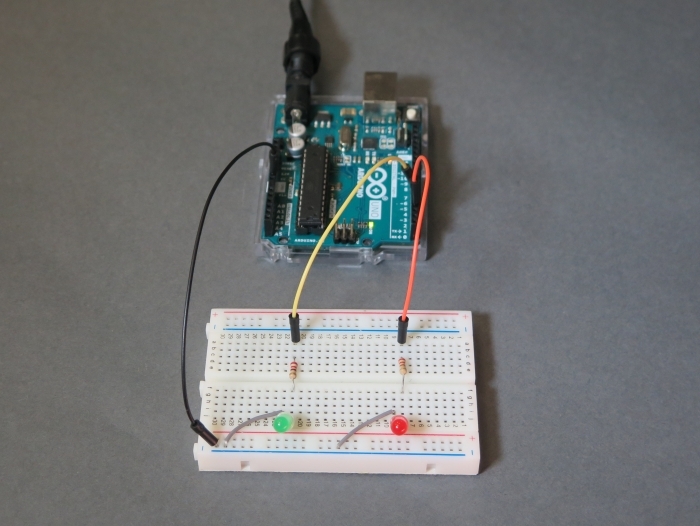 The second Arduino Board will control the brightness of two LEDs using the obtained data. The first step is to make the circuit for the Arduino board which sends data. Connect two potentiometers to the A0 and A1 analog ports on the Arduino board. 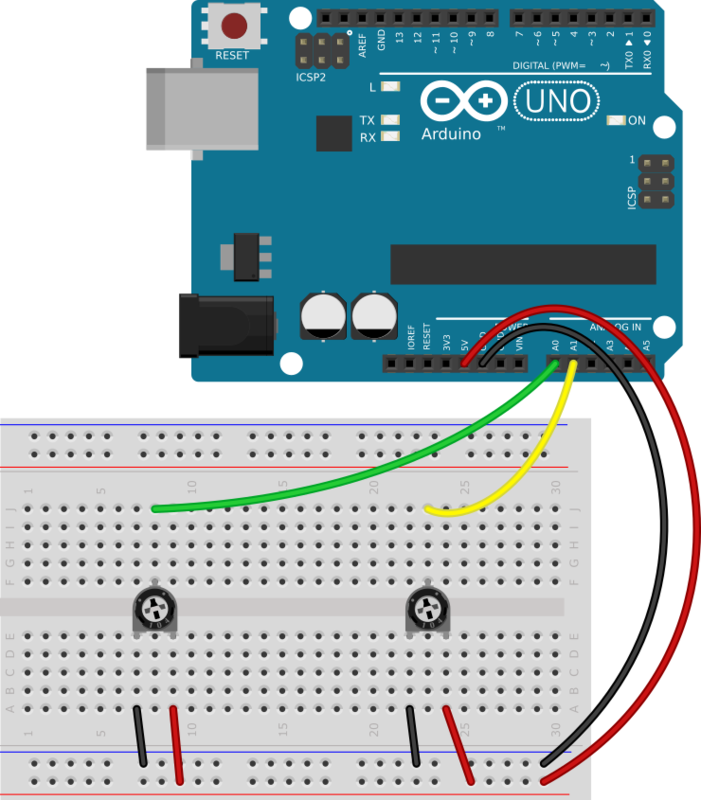 The second step is to make the circuit for the Arduino board which receives data. Connect two LED through the 220 ohm resistors to the D4 and D6 digital ports on the Arduino board. To control the brightness, both LEDs should be connected to ports which support PWM. 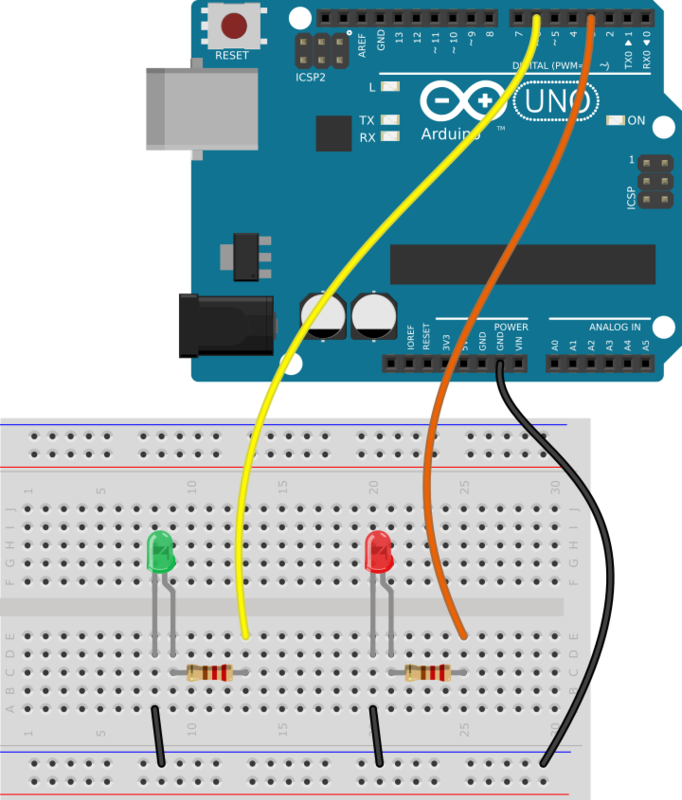 The third step is to create a UART connection between the Arduino boards. All Arduino boards have at least one UART interface also known as hardware serial or just “serial”. To communicate the serial interface uses two pins named TX and RX. TX and RX are abbreviations for Transmit and Receive, respectively. In this tutorial, the Arduino Uno boards which have only one UART interface It’s busy because we use it to load the firmware and communicate with the computer. So, let’s create a new software serial. Define digital pins TX and RX on both Arduino boards. Let the D8 Arduino pin be RX and the D9 Arduino pin be TX. To link two devices with a UART bus, the TX pin of the first device should be connected to the RX pin of the second device, while the TX pin of the second device should be connected to the RX pin of the first. This can be done physically by overlapping the wires. Link the D9 pin on the first Arduino board with the D8 pin on the second Arduino and D9 pin on the second Arduino board with the D8 pin on the first board. All signals require a reference voltage. The GND is what provides this reference for single-ended signals such as those used by a UART. Therefore the grounds on both boards should be joined. Link the GND pin on the first Arduino board with the GND pin on the second board. Create a new project in XOD and name it something like uart-led-control. We will create two XOD patches — one for each board. Create a new patch for the potentiometers connected board and name it pots. Let’s gather the values from the potentiometers and prepare them for the later serialization. Add two pot nodes onto the patch. They correspond to a couple of potentiometers on the breadboard. To avoid confusion, label them differently. For example, pot A and pot B. Set the PORT pins of the pot nodes. As we connected them to A0 and A1, we set the PORT pin values to A0 and A1. A pot node outputs the signal values in the range from 0 to 1. A potentiometer is an analog electronic component. Even if you don’t touch the potentiometer knob, the pot output value can continuously change for example from 0.855 to 0.856 and back. To get rid of these minor changes let’s round the potentiometers outputs to two decimal places after the dot. 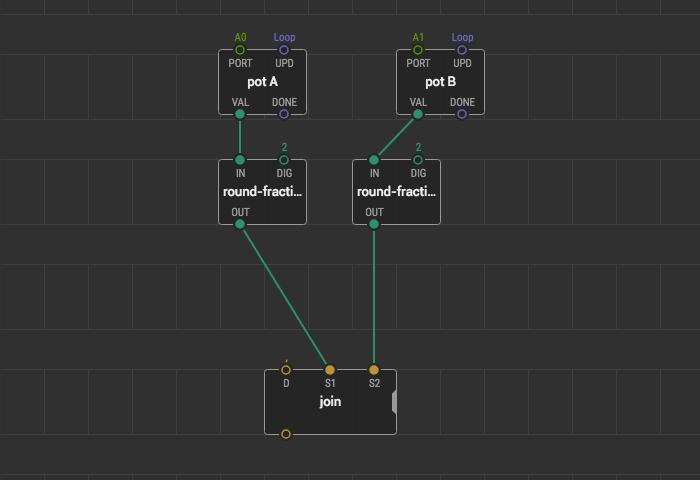 Add two round-fraction nodes onto the patch and link them with pot nodes. To set two decimal places after the dot, place the 2 value to the DIG pin. In this guide, we use the CSV (Comma-separated values) text-based format to form string lines with the data we transmit. Each line is a String of two signal values from potentiometers separated by a comma. Here is an example of the string: 0.25,0.95. To combine all data values to a single string, use the join node. Place join onto the patch. Set the delimiter value at the D pin to ,. Link the join node with both round-fraction nodes. Let’s define the software serial interface in the pots program and describe how the data is transferred. To set up the software serial interface put the soft-uart node from the xod/uart library onto the patch. Set the RX and TX pin values. We put the D8 value to the RX pin and the D9 value to the TX. The BAUD pin sets the data rate in bits per second (baud) for serial communication. These baud values are standardized. For the software serial interface, the maximum baud value is 115200. Note that the higher the baud value, the greater the chance that a data may get lost or broken during the transmission. We set the BAUD value to 19200. Add the print node from the xod/uart library into the patch. 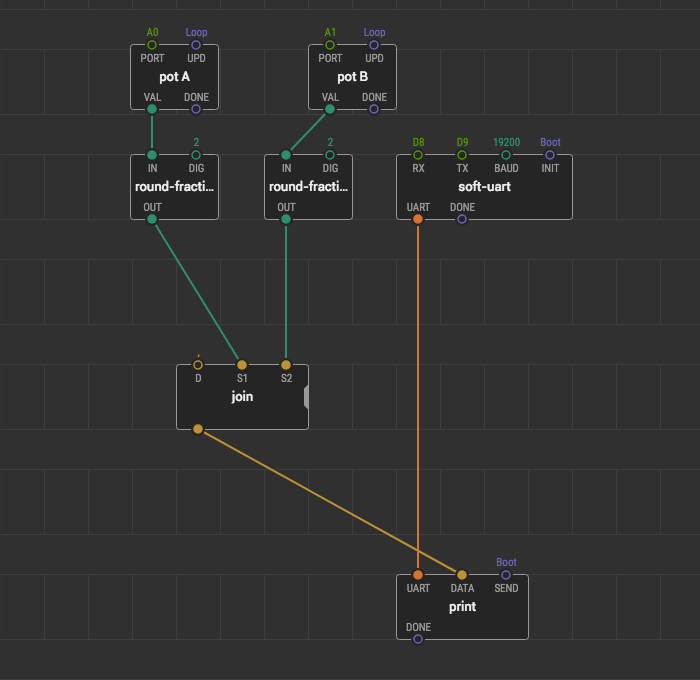 This node transforms a string value from the DATA pin into a single line by adding two bytes with a carriage return \r and line feed \n byte literals. After this print sends the line via UART each time the pulse signal comes on its SEND pin. Link the DATA pin with the join node. Link the UART pin of the print node with the soft-uart node. Here is an example of the line to be sent: 0.25,0.95\r\n. The last step for the pots patch is to limit the sending frequency. We will send a new line only when any of the potentiometer values changes. Also we are going to use a throttle node to slow down the pulse frequency. During the turn, a potentiometer generates lots of new values and the pulse rate is high. It is desirable to limit the pulse frequency so that each line has time to be sent in integrity. Add two pulse-on-change nodes onto the patch and link them with the round-fraction nodes. 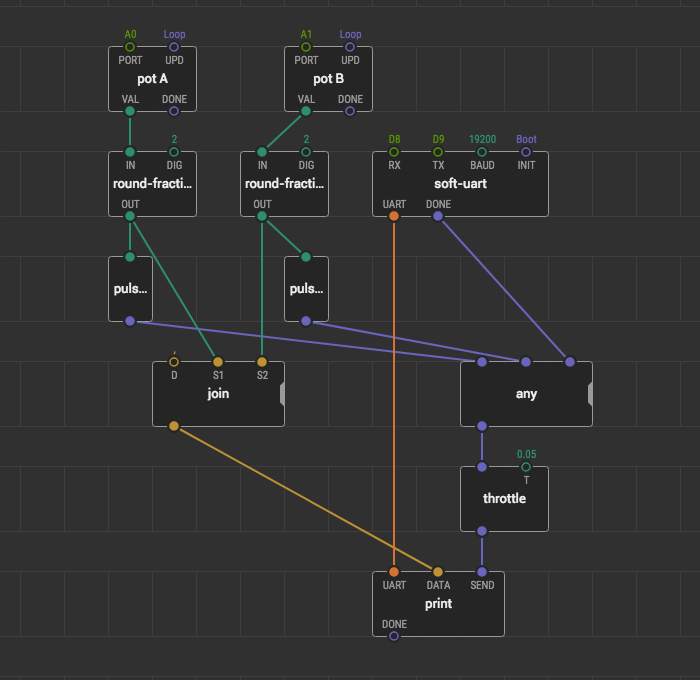 Put the any node onto the patch and link its inputs with the pulse-on-change nodes. Now, the any and pulse-on change nodes will generate a pulse if the potentiometer value is changed. Add the throttle node onto the patch and place it between any and print nodes. throttle passes a pulse through no more than once every T seconds. To slow down the frequency we place the 0.05 seconds value to the T pin. The patch for the first Arduino board is done. Upload, use a terminal emulator to observe the result. Let’s make the next patch. 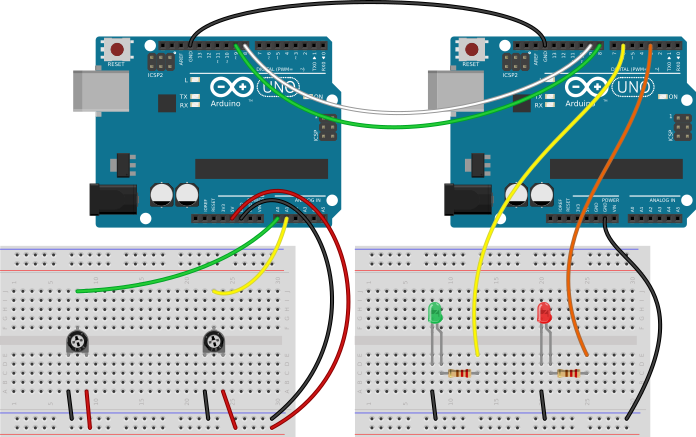 The program for the Arduino board with LEDs starts with receiving data from UART. Create a new patch for the LEDs connected board and name it leds. To set up the software serial interface put the soft-uart node from the xod/uart library onto the patch. Set RX and TX pin values. We put the D8 value to the RX pin and the D9 value to the TX. Arduino boards must communicate at the same speed. The BAUD pin value is the same as on the previous patch. Put the 19200 value to the BAUD pin. Add the read-line onto the patch. This node listens to the UART interface for the stream of bytes. If it is available, the read-line node searches the \n byte literal in it and dumps all the characters before the \n to a single line. It also cuts the \r byte literal from the output. The READ pin triggers a new read of a line. Link the UART pin of the read-line node with the soft-uart node and set the READ value to Continuously. When a line is received it has to be parsed. We will use the parse-tabular node to parse the serialized CSV line back into two numbers. Add two parse-tabular nodes onto the patch. One node per an LED. The parse-tabular node is inverse to join. It splits a string STR into tokens using D as a delimiter and outputs the token at index IDX. The IDX numbering starts at 0. For example, for the line ABCD,1234,EFGH with the , delimiter, the part with the 0 number is ABCD, the part with the 1 number is 1234, and the part with the 2 number is EFGH. 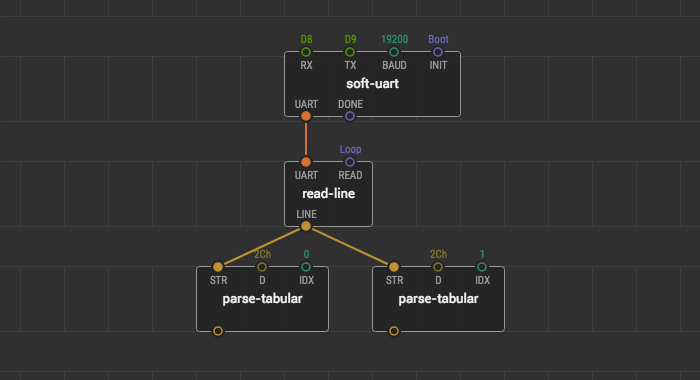 Link the STR pins of the parse-tabular nodes with the LINE pin of the read-line node. Set the delimiter at the D pins. Specify it as a character in single quotation marks. Set the IDX value of the first parse-tabular node to 0 to read the Pot A value. Set the IDX value of the second parse-tabular node to 1 to read the Pot B value. To complete the leds patch, it remains to send the line parts to the LEDs. 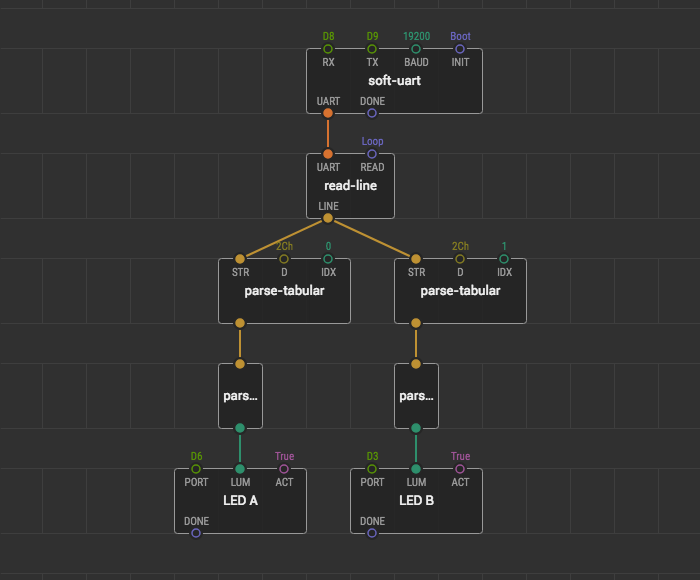 Put two parse-number nodes from the uart-example library to the patch and link them with the parse-tabular nodes. The parse-number node converts values from the String type to Number. Add to led nodes for each potentiometer. You can name them LED A and LED B as the potentiometers. As we connect LEDs to the D3 and D6 pins on the Arduino board, we put D3 and D6 values to the PORT pins of the led nodes. Link the parse-number outputs with the LUM pins of the led nodes. Both patches are done, you can upload them to their boards. If you have got problems trying to repeat the guide, download the prepared project and open it in the IDE.